How to convert png files to epub in windows? To convert png to epub in windows, the most commonly used software is the same software that builds epub file extensions in the first place. However, epub ebooks usually built in MAC or other operation system. Here is a software called ¡°png to Epub Converter ¡± that can be used to convert png to epub ebook in windows. Click 'Add' button to add png files to the listview. Set the epub options such as title, author, cover page and saving path. 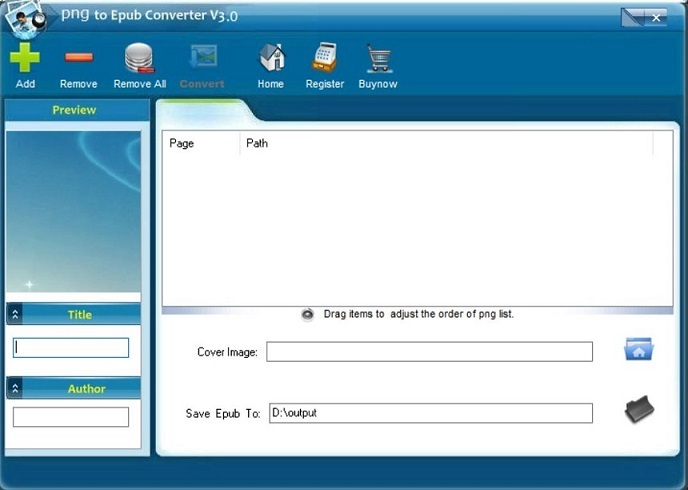 Click 'Convert' button to convert png files to a epub file. How to open epub in windows? How to convert jpg to epub? How to convert txt to epub?